Joachim and Ann are important as moral examples rather than truthful historical figures. According to legend, Joachim and Ann were married twenty years and still had not conceived a child. Living inNazareththey were upstanding citizens, always tithing one third of their income to the temple. After many years, their barrenness was considered a form of divine judgment and eventually their contribution to the temple was refused and they were ostracized by their community. In shame, Joachim went off to live with his shepherds. There he was visited by an angel who told him, that Ann was pregnant with a child named Mary who was to be dedicated to the Lord. He was to return home and find his wife, who would be waiting at the golden gate, the entrance to the city. Doing as he was told, his joyful reunion with Ann at the golden gate has become a famous image in art history. Mary was raised according to the instructions of the angel, she was consecrated to the Lord at infancy and sent off to live in the temple, away from the world, at the age of three. Accepting this great sacrifice of giving up what is most cherished to God, Joachim and Ann acted out an almost impossible act of faith. 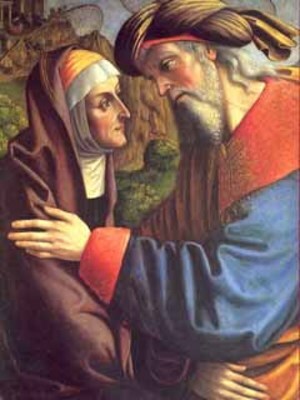 Though Saint Annwas younger and lived much longer than her husband, she and Joachim are inseparable in sharing the important patronage of grandparents. A rare image of Joachim as an older father, instructing the Virgin Mary to listen to God. God is directly speaking to this Father and daughter. Lily: the purity of Mary. (Excerpted from the new NOVENA APP by Barbara Calamari and Sandra DiPasqua, available soon). Patron: Ann: against poverty; barren; broommakers; cabinetmakers; carpenters; childless couples; equestrians; grandmothers; grandparents; homemakers; housewives; lace makers; lace workers; lost articles; miners; mothers; old-clothes dealers; pregnancy; pregnant women; horse riders; seamstresses; stablemen; sterility; turners; women in labour; Brittany; Canada; France; Quebec; archdiocese of Detroit, Michigan; diocese of Norwich, Connecticut; Santa Ana Indian Pueblo; Taos, New Mexico. Heard true stories about Novena. Need help I’m unemloyed and applied for several job opportunities never succeded. Prayed Novena in March got invitation to write aptitude test Passed the Test but didn’t get the job. Did Novena in may got another Invitation to write in june passed, but didn’t get the job. Don’t know what is wrong with me! Please help. Times are tough – keep trying. Saint Joseph is excellent when you need work. Saint Jude is great for impossible times. Keep your mind open and be very grateful for whatever you have. You are going to get a job. We will pray with you.